Thursday 20th October 2016 - Prof Mark Seaward and Mike Horne on "Geolichenology of churchyards". Mark Seaward PhD, DSc, Emeritus Professor at Bradford University, has a strong interest in biomonitoring pollution for which he has been internationally honoured, including the Acharius Medal, the Ursula Duncan Award and Doctor honoris causa of Wrocław University. He was the editor of The Naturalist for 34 years, is the author and editor of numerous books, and written more than 435 scientific papers, including many concerned with the biodeterioration of stonework by lichens. 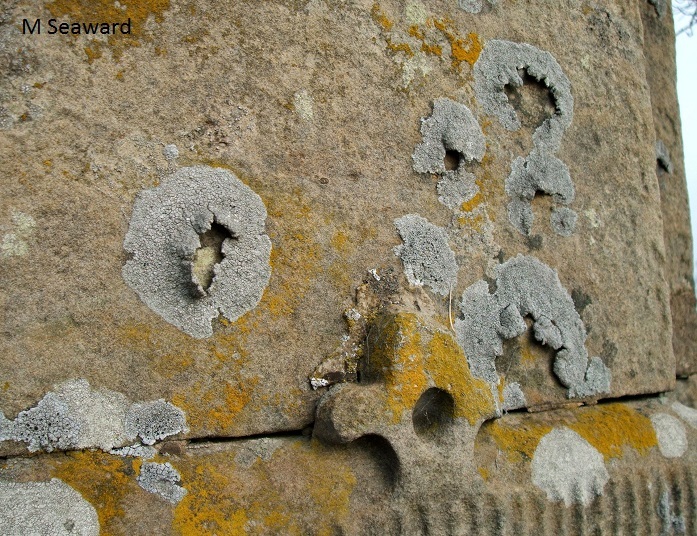 "For almost half a century our speaker has investigated the lichens of churches and churchyards, including 646 out of a possible 703 churches in Lincolnshire. The wide variety of surfaces of local and imported materials (limestones, sandstones, granite, slate, wood, metal, etc.) support characteristic lichen assemblages which create a colourful mosaic reflecting the patina of time. These habitats should be conserved on biological as well as historical grounds. 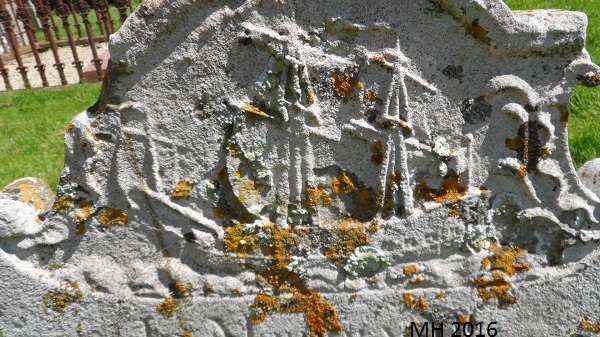 However, as revealed in most of the 75 churchyards resurveyed in the past 15 years, their sanctity and integrity has been lost through a wide range of disruptive human activities, more particularly chemical and mechanical cleaning of stone surfaces and the removal or re-siting of gravestones, exacerbated by pollution, poor maintenance, neglect or total abandonment, and even the creation of ‘nature reserves’. 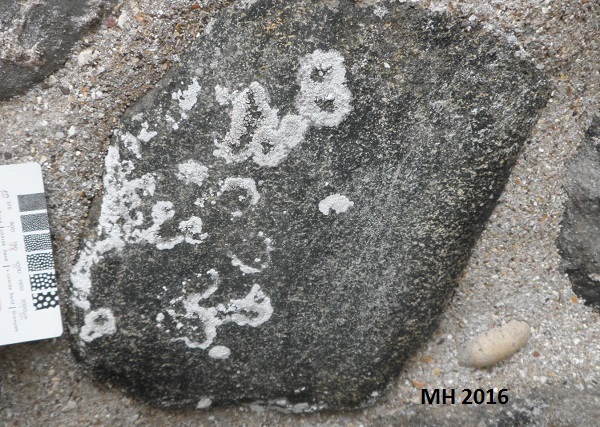 Due to their sensitivity to such disturbances, lichens have often been the major casualties. " Mike Horne FGS has been the Secretary of the Hull Geological Society since 1984 and has a keen interest in "Urban Geology". "Churches, graveyards and cemeteries provide fascinating opportunities to study geology and weathering processes as well as social history and wildlife. In the lecture the speaker will also explore the threats to the geoconservation of these sites." Summer 2016 - Message from the Secretary - I apologise for the delay in posting the Summer Programme to members and a lack of e-mail newsletters; my new PC was faulty and PC World took 6 weeks to fit a new motherboard and then wiped the hard-drive. Now I am having to reinstall my software and data files on the hard-drive. The e-mail address book has been lost so please would members send me a e-mail so I can capture their address? Easter 2016 Nine members attended the Conservation Visit to Rifle Butts SSSI and the Society thanks them for their help. There was not a much work to do as usual due to the mild winter; though we did experience several seasons' weather on the day (sunshine, April showers, hail and sleet)! The Society adopted an amended Rules at the 2016 AGM and the Committee has created a set of policy documents to add details and outline current practice. The subscription year has been changed to a calendar year starting on January 1st, but members are encouraged to pay in advance when they receive the Winter Programme in October. Sheila Rogers passed away on 1st March 2016. Sheila joined the Society in June 1972 and resigned in May 2011. She became a member of the Committee in 1981 and was Vice President in 1983-4 and President from 1984 to 1987. She was also the Membership Secretary of the Yorkshire Geological Society. The Society sends its condolences to Peter and the family. 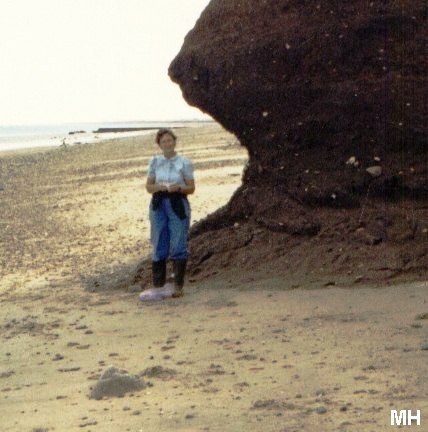 New for 2016 - we will be adding pages from previous publications (Transactions of the Hull Geological Society and East Yorkshire Field Studies). The Committee is proposing to change the Rules to reflect current practice, details will be posted with the AGM agenda. We will also be publishing generic risk assessments and more information for members. Thursday 17th March 2016 - Prof. Mark Bateman of Sheffield University on "A Winter’s Tale: When England was really frozen"
Abstract - " During the Last Glaciation (~21,000 years ago) of the UK ice on the Eastern side of England stretched as far south as Yorkshire and the Norfolk Coast of East Anglia. As part of an ongoing large research project called BRITICE-CHRONO the timing of the deglaciation of the whole of the UK is being attempted. This talk will look at the latest ideas of how far ice reached in Yorkshire, Lincolnshire and Norfolk, when it advanced and when it retreated. The talk will also look at the wonderful preserved periglacial landscape beyond the ice limits to be found in Norfolk and Suffolk. Here, the Upper Cretaceous limestones (chalk) has been subjected to intense cold climates giving rise to distinctive patterned ground. But is this landscape just the result of the cold associated with the Last Glaciation or something which has evolved over much longer parts of the Quaternary period?" Saturday 20th February 2016 - Dean Lomax of the University of Manchester on "British Dinosaurs: A Story Untold"
This meeting was attended by over 60 people and I thank the audience for their generous donations to Society funds. I also thank the Security and Portering Staff at the University for finding us a suitable lecture theatre at short notice because the one we planned to use had been double booked. Also unfortunately the Society's signing-in book was stolen at the meeting. The book was started at the 125th Anniversary Celebrations and formed an interesting archive. 'Dinosaur' and 'Britain' are two words that are rarely used together, yet dinosaurs are a British invention! If you were asked to name a dinosaur, the chances are you would give a foreign example, such as Tyrannosaurus rex, despite the term 'dinosaur' having been conceived by a British palaeontologist for fossils found in England. In this engaging talk, Dean Lomax, will give an overview of the extraordinary dinosaur remains found across Britain. The talk was followed by a book signing. Dean is an award-winning palaeontologist, science communicator and author. 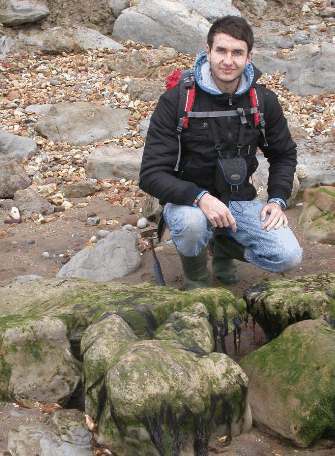 He has travelled around the world and worked on many fascinating projects from excavating dinosaurs in the American West to discovering new species of extinct marine reptiles in the UK. An Honorary Scientist at The University of Manchester, Dean is passionate about communicating palaeontology and actively engages with traditional and social media. He has written two books, numerous scientific papers and many popular articles and regularly appears on television, most recently as series advisor and recurring on-screen expert for ITV’s Dinosaur Britain (a two-part series based in-part on the book Dinosaurs of the British Isles). Dean is also the patron of UKAFH. You can follow Dean’s adventures using Twitter and Facebook. Thursday 11th February 2016 - Terry Rockett on "Five active volcanoes in southern Italy"
During and since the Tertiary era the African Tectonic Plate has been moving northwards into the Eurasian Plate. At first this resulted in the closing of the Tethys Ocean. The leading edge of the Eurasian Plate buckled and folded to form the Alps. An andesitic island arc formed, becoming some of the Aeolian Islands. The islands are geologically young, the oldest dating back only 330,000 years. Vulcano and Stromboli (the only constantly erupting volcano in Europe) are here. On Sicily Etna is Europe’s largest volcano and one of the most active volcanoes on earth. On the mainland Vesuvius is a classic strato-cone volcano, and Solfatara, to the west of Naples, is a low lying volcano with a magma chamber just beneath the surface. In the talk the geological setting and characteristics of each volcano will be described. Thursday 19th November 2015 - Ian Heppenstall on "Geology between Settle and Malham". A traveller stopping when on Scothrop Lane and looking towards the north will find an exiting landscape revealed to them. Rising abruptly from the moor, a number of hills are visible, with the line of the Middle Craven Fault looming behind or between them. On the clearest of days Malham Cove and Cawden can be seen to terminate the line in the east whilst opposite the traveller is the gritstone of Kirby Fell backed by the limestone of Pikedaw and to the west of these Rye Loaf Hill can be seen. West of Rye Loaf, closer to Settle, the view is not so well defined and it is best to continue west to find out what is there. Having passed Scaleber Force where the waters of Stockdale Beck tumble down the South Craven Fault a stop at the end of Stockdale Lane provides the best view of the magnificent, limestone crags of the Middle Craven Fault as they rise almost vertically from the grassy, scree slopes beneath. turning towards the west there are more crags on High Hill, these being part of the South Craven Fault. There is only one good way to see all this scenery and that is to set off walking and to view it close up. So, if you are an enthusiast of the Yorkshire Dales (or not) join us on 19th. November 2015 at a meeting of Hull Geological Society in the Cohen Building (University of Hull) and I will take you on a geological journey, beginning in Settle and ending at Gordale Scar near Malham, explaining some karst features, introducing you to some of the local notable geologists and visiting a few historic sites scattered about the landscape. The following speakers have confirmed - Felix Gradstein, Rory Mortimore and Chris Jeans. Rory will be speaking about "Offshore Northern Province Chalks in the North Sea". Booking via Eventbrite is still open – follow the links from the YGS website. The closing date for registration is 1st September. You must register if you wish to attend any session (including the Saturday afternoon keynote lectures). A full list of speakers and their abstracts is being added to the HGS website as details are received from the Symposium Secretary, Dave Greenough. The Symposium Dinner is likely to cost £49 for a 3 course meal and is likely to be held at an hotel in the city centre. Sunday 26th April - Chalk Lithostratigraphy and Structure in East Yorkshire organised by Huddersfield Geology Group and led by Paul Hildreth. Sunday 10th May at 11.00. Auk and Chalk Walk at the Bempton Cliffs Reserve on Flamborough Head led by Paul Hildreth. Sunday 24th May at 11.00. Auk and Chalk Walk at the Bempton Cliffs Reserve on Flamborough Head led by Paul Hildreth. Saturday 30th May . "What can we learn from the Chalk of the Wolds?" organised by the Scarborough Rotunda Geology Group and led by Derek Gobbett. A member of the Open University Geological Society contacted me in January 2015 because she was disappointed with an App had bought from the Apple I-Tunes Store. I investigated further. The App was called "Fossil Guide" and was being sold by someone called "Rick Stonecypher" (perhaps a pseudonym) of a company called Phad.net for 99 US cents or 66 pence (Sterling) by Apple I-Tunes. The App was valued to be worth $ 3646 even though it had mixed reviews from its customers. The OU member told me "It seems they have used a number of your photographs but then misquoted your information and added bits of their own which are mainly incorrect. " I looked at the advert for the "Fossil Guide" App on the Apple I-Tunes website and the 24 pictures of fossils on the screenshot seemed to be small versions 24 of the 28 images on the "East Coast Fossils Identification" on the Hull Geological Society web-pages created in 2007 by David Baker that can be viewed by anyone for free. I contacted Apple I-Tunes to request a copyright fee for the HGS. Apple told me that they were not responsible for the content of the Apps they sell. They did pass on our complaint to Mr. Stonecypher of Phad.net and this is his reply :- "We bought images from an Indian coder many years ago that made our app , we will remove the app now and try to contact the freelance site to see if the coder can explain further. We are currently filing closure of our corporation and going into bankruptcy so thank you for contacting us to remove the application promptly. We apologize for any inconvenience as we check to verify what images and why they were used. I will update you if I find more information. …..I don't normally check this email so I feel blessed to receive your contact today. Thank you and God bless"
Sunday 14th June 2015 - field meeting to Victoria Cave and Warrendale led by Ian Heppenstall. Booking Required. "Passing through the Horseshoe Iron Age Settlement the walk takes in Attermire Scar, Warrendale, Attermire Cave, Victoria Cave and Jubilee Cave, plus some stunning limestone scenery. Bring a powerful torch and a hard hat. The event lasts 3-4 hours is over slippery and rocky paths. After Jubilee Cave we will retrace our steps." "The Warrendale Caves are situated in the limestone uplands to the east of Settle and include Attermire Cave, Victoria Cave, Jubilee Cave and numerous others. The scar in which they lie is named Attermire Scar and on the west side of the valley from which they are accessed is Warrendale Knotts, a limestone knoll with a number of summits - the Knotts. The dale, which runs in approximately north/south direction takes its name from the large number of rabbit warrens within it and, possibly, the warren of caves. The ground is usually littered with the carcasses of dead rabbits and the shotgun cases from the means of their demise. "Our walk starts at a gate accessed from Stockdale Lane, from which we proceed towards Settle along an old road. When we reach the pass between Sugar Loaf Hill and Warrendale Knotts we turn right (north) without passing through a gate ahead of us. We then continue along Warrendale where we can see the caves in the bedded limestone scars. Limited entry is possible for short distances into some of them but for deep penetration caving gear is necessary. Powerful torches can be used to view into the caves from their entrances. Jubilee cave can be entered an explored as natural light penetrates but the roof is low and it is necessary to stoop. Water drips from the roof and the cave floor is very wet. The only time I entered Victoria Cave I found the floor to be muddy and slippery. The darkness was overwhelming and my torch beam would not penetrate. I did not go far. Turning back at Jubilee cave gives the opportunity to view the caves twice or to venture up on the Knotts for a while. "The total distance walked will be about four miles and it should be possible to complete it in four hours or less. "Members should allow two and a half hours travelling time to reach the Stockdale Lane gate by 1100 hours. This means leaving Hull at about 0830. I recommend that people meet at the university and share cars so that Stockdale lane is not choked up with parked cars. Finishing at 1500 hours should mean that members can be back in Hull for 1730. "The best route from Hull, Beverley etc. is to travel to the Market Weighton Bypass and then take the A59, bypassing York, passing through Tadcaster then to Knaresborough and Harrogate. Heavy traffic is often encountered on High Harrogate. From Harrogate continue past Menwith Hill listening station, through Blubberhouses and over Blubberhouses Moor taking the road to Skipton. At Skipton take the bypass and continue on the Gargrave road. "At Gargrave there are two alternatives: 1) Turn right in the village onto the Eshton/Malham Road and continue to Airton. Pass through Airton and at the other side take the road through Scothrop. This leads onto Scothrop Lane which leads to High Lane. Just after passing Scaleber Force turn right onto Stockdale Lane and proceed up the lane until you see me and Mary standing at the gate. 2) Continue through Gargrave to Settle. Upon entering the township turn right and follow the roads to High Settle. At a Y junction on High Settle there is a very sharp right turn which leads on to High Lane. Continue on High Lane and just before reaching Scaleber Force turn left onto Stockdale lane, proceeding until reaching a suitable parking spot near the gate. "Please bear in mind that Stockdale farm is a working farm from which silage is sold and is also a cattle and sheep farm. June is a month when silage may be cut and there may be grass cutting machinery and/or cattle trucks on the move even on a Sunday. Please park close in and remember that grass verges may be boggy if the weather has been wet. " Sunday 31st May 2015 - Urban Geology Walk in Hull led by Mike Horne (part of Yorkshire Geology Month 2015) . Meet outside the Tourist Information Office at City Hall, Queen Victoria Square at 10-30 am. Lasts about 2 hours, bring a magnifying glass. No charge but donations to Hull Geological Society funds would be appreciated. Saturday 16th May 2015 - Rock and Fossil Roadshow at the Treasure House in Beverley - 11 am to 3pm. Bring along your rock, fossil and mineral finds to be identified by members of the Hull Geological Society. Learn more about what can be found locally; look at displays and talk to experts. Please note that no valuations can be given. There will be a hands-on craft activity for children of all ages. Children must be accompanied by an adult. Admission free. Thursday 5th March 2015- by Rodger Connell on "From Wollaston and Brora to Brae: Understanding your oil field: or the search for an analogue?" South Brae is a world class oilfield located 160 miles northeast of Aberdeen, close to the UK/Norway boundary line in the North Sea. Its reservoir rocks were deposited during the Late Jurassic in a failed rift system (the South Viking Graben) before crustal extension switched to the North Atlantic margin. It was discovered in 1977 (previous exploration wells had discovered a number of other fields in the area) but was the first into production through the Brae A platform in 1983. To date some 340 mmbbls of oil have been produced from some 800 mmbbls originally in the reservoir, and it is still producing. The top of the reservoir is at ~11,800 ft below sea level with a gross oil column of 1,670 ft and a reservoir pressure of 7,128 psia. It is one of a number of fields in the area which have produced over 1.6 billion barrels of oil to date. However, its early history was one of controversy over the model used to describe the deposition of the Late Jurassic reservoir sediments. The model being important as it drives the placing of wells to extract oil in the most efficient fashion. Initially it was thought the reservoir was a series of stacked, semi-circular, fan deltas. Others thought the rocks were part of a small radius submarine fan with contrasting predictions for reservoir distribution. The earliest development well did not show the prognosed stratigraphy so as part of the ongoing field development work a number of potential analogue sequences were visited to examine the rock types deposited, along with a review of the geology of cores already recovered from the reservoir. We were lucky enough to visit East Greenland to see modern fan deltas and Jurassic/Cretaceous coarse grained submarine fan deposits. In northern Scotland we visited the onshore outcrop of Middle-Late Jurassic sediments deposited contemporaneously with those at Brae in the rifted Inner Moray Firth Basin. The talk will focus on the rocks we visited in East Greenland (Wollaston Foreland) and the Brora-Helmsdale area in northern Scotland, with a few diversions along the way. These visits, along with detailed sedimentological and palaeontological work on the core material recovered, allied to better quality 3D seismic surveys and extensive reservoir engineering studies by the Brae teams, resulted in improved reservoir models both at the field and regional scales. Though no one outcrop visited provided a complete analogue for the South Brae reservoir they certainly allowed a much better understanding of depositional processes within the evolving rift basin and the likely organisation of the reservoir units and their controls. A number of typical core sequences recovered from the South Brae reservoir will be on display so you can try your hand at unravelling the depositional processes at work to form the reservoir back in the Late Jurassic! Thursday 26th February 2015 - joint evening meeting with the Harker Geological Society at 6-20pm - lecture by Lyall Anderson :- "Alfred Harker's Times and Travels". Documents held by the Archive of the Sedgwick Museum of Earth Sciences (University of Cambridge) have provided new insights into the eminent igneous petrologist Alfred Harker (1859 - 1939). His meticulously kept field notebooks and sketchbooks chart his development as a geologist over a career spanning some 60 years. The enthusiastic boy who collected fossils on the North Yorkshire coast, became an undergraduate at St. John's College, Cambridge, before working as a Demonstrator for the Department of Geology and the Woodwardian Museum there. Affiliated with the Museum, Harker continued his fieldwork and collecting, including an extended trip to the Western USA in 1891, and collaborative work in the English Lake District with his friend John E. Marr (1857 - 1933). Later in 1895, Harker accepted a part-time contract geological mapping on the Isle of Skye with the Geological Survey of Scotland. Over the next ten years, this led to several Survey Memoirs along with many new discoveries and insights into igneous processes. In retirement, Harker continued to visit Scotland taking pleasure cruises around the West coast in the 1920's and 30's. Sat on deck, he sketched the landscape and geology as it passed by. His work on what was then called the Tertiary Volcanic Province was continued by one of his former students, Edward B. Bailey (1881 - 1965), no doubt under his mentor's encouraging and watchful eye. This work is part of a much larger project to document and make accessible geological archive materials through a free online resource called "The Archives Hub". [http://www.archiveshub.ac.uk/]. Lyall Anderson is currently an Honorary Research Fellow with the School of Museum Studies, University of Leicester. His interest in geology began at an early age with collecting the Devonian fossils and agates of the East coast of Scotland. He worked at National Museums of Scotland for 7 years curating the invertebrate fossils before moving to Cambridge in 2007 to work on Charles Darwin's geological collections. Whilst there, he uncovered Alfred Harker's vast archive in boxes in the museum store. Some findings from this form the basis of the talk to the Society. He is married and now lives in Bradford, West Yorkshire.